Please enjoy his piano recordings. Acclaimed for the immediacy, sensitivity and depth of his interpretations, Sergei Babayan's performances reveal an emotional intensity and bold energy, equipping him to explore stylistically diverse repertoire. He is known for his innovative programming, often including modern works by composers such as Lutoslawsky, Ligeti and Arvo Part, and extending the boundaries of mainstream repertoire for which he continues to be acclaimed, excelling in Mozart, Beethoven, Brahms and Schumann as much as the Russian heritage of Rachmaninoff, Scriabin and Prokofiev. His philosophy that a recital should reveal a spiritual dimension, results in playing which sustains an intensity which never fails to captivate. His performances of J S Bach, have always gained him both public and critical acclaim, and he firmly believes that the natural evolution of the keyboard instrument has led to today's modern piano which allows the music to be fully expressed in this modern incarnation. A student of such legendary teachers and musicians as Gornostayeva, Naumov, Pletnev and Vlasenko in the Moscow Conservatory, he was, however, not permitted to leave the country and be free to compete and study in the West. He was the first pianist from the former USSR who was able to compete without government sponsorship after the collapse of the system. Immediately after his first trip outside of the USSR, he won consecutive first prizes in several major international competitions including the -Robert Casadesus International Piano Competition (formerly the Cleveland International Piano Competition) (1990) -The Palm Beach International Piano Competition (1990), -The Hamamatsu Piano Competition (1991) -The Scottish International Piano Competition (1992 ). He is also a Laureate of the Queen Elizabeth International Piano Competition, the Busoni International Piano Competition, and the Esther Honens International Competition in Calgary, Canada. Since that time he has had major engagements and concert tours throughout Europe, Japan, New Zealand, Australia, South Africa, South America and the USA. His New York recitals at Carnegie Hall and Alice Tully Hall, performances with the Cleveland Orchestra, Baltimore Symphony, and Detroit Symphony met with huge critical acclaim, as have his many subsequent recital and concerto performances throughout all the major cities in the US. His concert schedule has included performances and broadcasts throughout major European cities and extensive tours of Japan. He appeared with recitals in such important venues as Salle Gaveau in Paris, Wigmore Hall in London, Carnegie Hall in New York, the Warsaw Philharmonic, Severance Hall in Cleveland, Bolshoy Zal of Moscow Tchaikovsky Conservatory, and countless others. In recent seasons he performed recitals in New York City, London, Hannover, Manchester, Bruxelles, Glasgow, Moscow, St. Petersburg, Paris, Grenoble, Tours, Warsaw, Tokyo, Osaka, Sapporo, Philadelphia, Washington DC, Chicago, San Francisco, Los Angeles, Cleveland, Seattle, Atlanta, Miami, and New Orleans..
Mr. Babayan has appeared with many major orchestras throughout the world including the Cleveland Orchestra, the Warsaw Philharmonic, the BBC Scottish Symphony Orchestra, the Orchestre Nationale de Lille, and New World Symphony. His performances with the Detroit Symphony Orchestra and the Baltimore Symphony Orchestra were received with great enthusiasm by audiences and critics alike. He has collaborated with such conductors as Yuri Temirkanov, Neeme Jarvi, Hans Graf, David Robertson, Kazimierz Kord and Michael Christi, and his concerto repertoire is constantly growing - at this point he has 51 concertos which have been performed. His unusual and imaginative recital programming has always elicited interest and praise. Mr. Babayan is an enthusiastic advocate of new music and has an immense repertoire. Sergei Babayan�s deep interest and love for the music of Bach has led him to study more recently with Helmuth Rilling. Always in search of the new, Sergei Babayan studied conducting in order to deepen his understanding of the orchestra, to be able to study and perform some of the music of the 20th century which is particularly interesting for him, as well as to conduct piano and orchestra repertoire from the keyboard. In this role, he already has performed music of Bach, Haydn, Mozart, Schnittke, Part, Vasks, Schedrin, and Prokofiev. 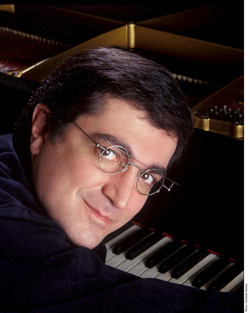 In May of 2006 Sergei Babayan was invited by Valery Gergiev to perform Lutoslawsky piano concerto in the XIV International Festival �Stars of the White Nights� in St. Petersburg with the orchestra of Mariinsky Theatre. Performance was highly praised in major Russian publications and met with great enthusiasm by the audience. He has recently invited by Gergiev to perform Prokofiev �s 3rd piano concerto in his Easter Festival, and will return to London in 2010 to perform at the Barbican with the London Symphony Orchestra under the direction of Gergiev. Other recent highlights include the Prague Spring Festival with the Janacek Chember Orchestra and an acclaimed recital at the 92nd Y in New York. Copyright © 2009 - 2015 Hudson River Pianofest, MIS of North America, Inc. All Rights Reserved. Designated trademarks and brands are the property of their respective owners.